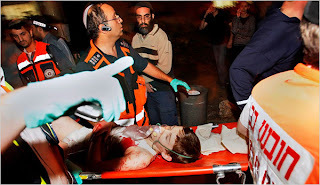 The attacker entered the yeshiva and opened fire on students before he was gunned down himself by an armed civilian. Witnesses say that the attack began in the seminary's library with the terrorist spraying bullets in every direction before anyone could react. "It was a slaughterhouse," said Yehuda Meshi-Zahav, head of the Zaka emergency service after surveying the scene at the Merkaz Harav seminary, one of the most prominent Jewish educational centres in Jerusalem. While most of the students are high-school age, the dead were all thought to be between 20 and 30 years of age. 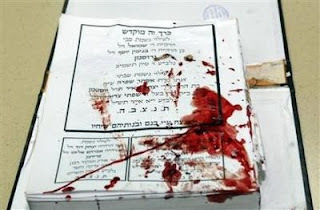 It was the deadliest attack on Israeli civilians in nearly two years and the first attack inside Jerusalem in four. It occurred at the start of the Hebrew month in which the Purim holiday occurs, and many of the witnesses at first thought the gunfire was firecrackers in celebration. The part-time yeshiva student who killed the terrorist, 40-year-old Yitzchak Dadon, said that he shot the attacker in the head with his personal weapon. David Shapira, a yeshiva graduate and officer in the paratroopers, heard the shots from his nearby home, ran to the yeshiva and "finished [the terrorist] off." Asked by a Channel 2 TV reporter what weapon the Palestinian Authority terrorist had, Dadon said, "A Kalachnikov," and turning to the camera, he angrily added, "The Kalachnikov that you gave him, President Peres ..."
In Gaza City, Palestinians went out into the streets and fired rifles in the air in celebration of the attack against the Jews of Jerusalem. Some fired weapons in the air, and threw sound bombs in the streets, while drivers pressed on their cars horns. Other Palestinians delivered candies and sweets in the streets in celebration. Mosques loudspeakers in Gaza also broadcasted verses of the Quran, the Moslem holy book, with speakers saying "we congratulate our people for the heroic and selective attack in Jerusalem." The Merkaz HaRav Yeshiva is located near the entrance to Jerusalem, in the Kiryat Moshe neighborhood. The yeshiva, founded by Rabbi Avraham Yitzchak Kook, is at the heart of the national-religious movement in Israel.